Another Chinese New Year bento for the kids. This time I made one boy and one girl from rice molded by my hand. Since the CNY is also the same day with Valentine's Day this year, I put sweetened red cherry with heart food pick and decorated the lucky money envelope with tiny heart too. Inside the other tier box : fish balls & flower carrots, cucumber pot with corns mayonnaise, tomato cherry, flower shapes satsumaimo or Japanese sweet potatoes, and chikuwa fish stuffed with asparagus. I finally managed to use my hong bao (lucky money envelope) for the background. I've got this fancy hong bao with bell and it can stand up too, cool right! Wow Lia, how beautiful! 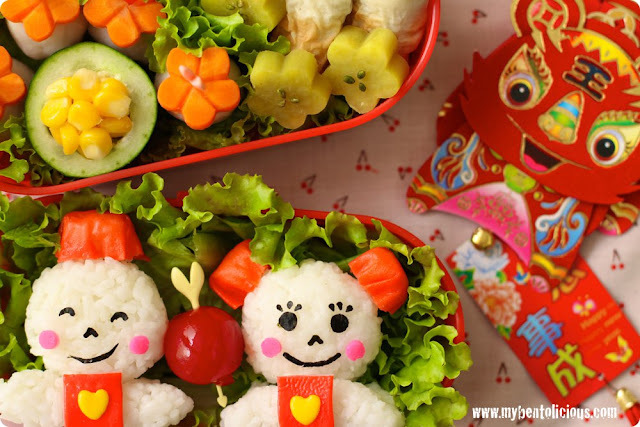 That is an awesome CNY bento! I am amazed at all of the gorgeous details! Eeeep! I stared so long at this bento, because I can't believe you made such a beautiful work of art! Those children are so wonderful, and the flower details that you are so expert at... everything looks like a celebration in the bento box. Love it! I have the hong bao with the bell too, they have some really cool ones that stand up and open out... Gung Hay Fat Choy to you and your family Lia!! Wonderful Lia! When I look at your masterpiece bento creations I am just amazed at your artistic interpretaions and creativity. Applause! @susanyuen : Thanks a lot Susan for your kind comment! wishing u and family happy chinese new year too :) u did v well on sculpting the persons. 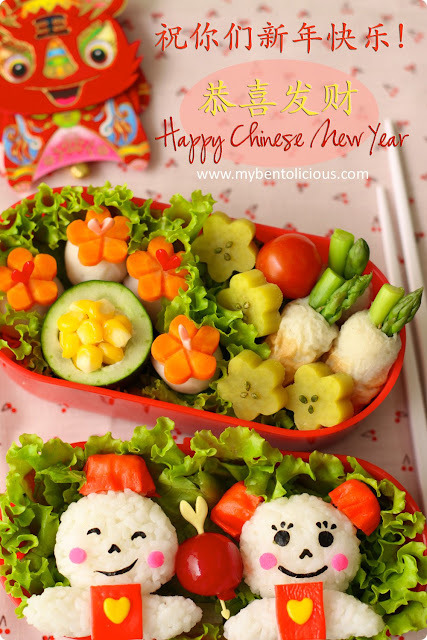 Ur bento & its colors always amazed me, extremely cute for this one too! So special, you've really captured the good cheer, confidence and well-being of this celebration so well in this bright and beautiful bento, Lia! Thank you for sharing your great gifts with us! Wishing you and your family joy, health and well-being in the new year! @Jenn : Yes, kids will be having fun receiving so many hong bao. Thanks a lot Jenn! @COLARGOL : Thanks a lot! I love your creative ideas all the time Lia. And yeah, I'm yet to pack the red packets! Everything you make looks so perfect! The colors are so vivid and the corn in the cucumber bowl is a wonderful idea! @tigerfish : Thank you so much! They're delighted to get the otoshidama (红包). I think they may be your kids. Since nobody give me hong bao I'd love it!! This bento is also wonderful. You are really great Lia! first, thank you for telling me the name of the seseme balls! The lady at the bakery wrote it down for me, but I can't read chinese characters. so thanks! And I love the cucumber pot and chikuwa fish! I'm craving a steamed satsumaimo now too! Happy New Year to you and your family!